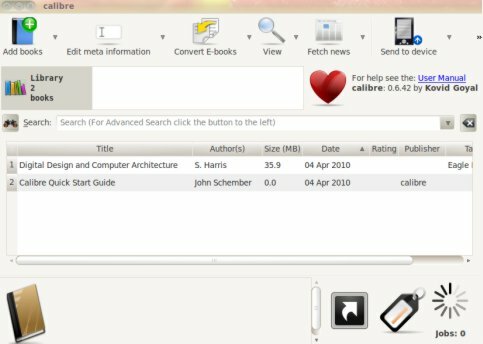 Calibre is an ebook library management software.This post will explain you about installing calibre(ebook collection manager) on Ubuntu OS(the process is same for almost all versions like ubuntu 9.10/10.04/10.10 …and others).Calibre is an open source and free application and in ubuntu you can find it in software center or package manager.You can also download and install it manually from it’s official website(http://calibre-ebook.com/).Calibre has support for wide range of formats,some most common formats are *.pdf,*.mobi,*.epub,*.html,*.odt,*.lit,*.txt.It’s very easy to import books from one platform to other (in couple of clicks) by using calibre. #2. Wait until the installation is complete. #1. Open Ubuntu Software Center and then move to Get Software -> Office and click on install in calibre row. #2. Enter password if required and then wait for few minutes for the installation to complete. Conclusion : Calibre is one of the most popular ebook management application;due to the various formats support it’s known as universal ebook reader.After the completion of installation you can access it from Applications->Office->Calibre.